On Monday I reviewed Christopher West’s new book, At the Heart of the Gospel: Reclaiming the Body for the New Evangelization. Today I’m featuring an interview I did with Christopher in which he covers a range of interesting topics. 0:42 – What is the ‘theology of the body’? 6:45 – Is it possible to overcome concupiscence in this life? 12:24 – Why is Ephesians 5 so important to the ‘theology of the body’? 20:51 – What role does Mary play in the ‘theology of the body? 24:59 – What one thing would Christopher say to the modern world? 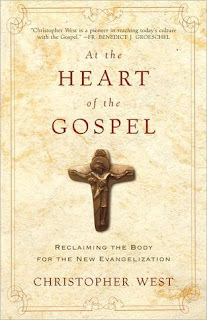 Check out Christopher’s new book, At the Heart of the Gospel: Reclaiming the Body for the New Evangelization, and learn more about his work at ChristopherWest.com. What do you think about the ‘theology of the body’? I just wanted to tell you I much I appreciated the interview. I like the format, the length that allows to go deeper in the matter and the tone. Keep up the good work! Thanks! That’s really encouraging to hear. I’m planning some more video interviews soon so stay tuned! Brandon, what program/app are you using for these interviews? Great job. Great question! I spent many, many hours researching this and testing out different set ups. – Record three separate streams (audio, my video, Christopher’s video) using Evaer (www.evaer.com). The free version only let’s you record up to 5 minutes, but I think the $20 full version is worth it. – Use Sony Vegas to edit the audio and video streams. No matter what program I used to record, the audio and video were always out of line (I’m thinking it has something to do with bandwidth lag). So I had to “re-align” each stream in Vegas, add some graphics, and text, and voila. You can also use Windows Movie Maker to edit the piece, but it’s much clunkier. Congratulations on the great interview. Theology of the Body is one optic which is helpful today. I think it has been a vital and helpful teaching tool to reach those otherwise schooled in the modern mindset. I am a bit concerned by some proponents, who seem to view Theology of the Body as replacing “outdated” sources, even Scriptural ones, leading to a hermeneutic of discontinuity. I heard proponent state that since God made the body, and the body was made for conjugal relations, and marriage was established by God for a conjugal relationship, “marriage is superior to celibacy.” (this is, of course, simplified) St. Paul’s words regarding celibacy for the kingdom, and that for some it is better to marry than to burn, were dismissed as too negative, since they went contrary to this logic. I’m probably being too geeky being mostly interested in the technical aspects of this Christopher West interview and the time stamp linking. 🙂 Good interview catch! Your opening remarks cannot be heard, but Chris is clear and audible. I’ll try to fix it. I think the issue is a Left/Right audio thing where Christopher’s voice comes out one side and mine another. OK. I think I fixed it, Tito. Let me know if you have any issues. Thanks for pointing out the glitch!